Kombi Sambas are going for big money these days. 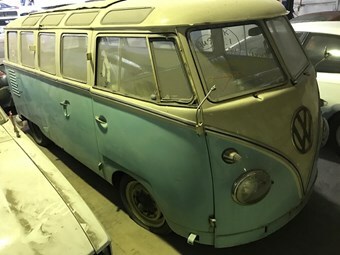 There was a time when asking over $60,000 for a Kombi in need of serious remedial work would have made you a laughing stock. Not any more. Volkswagen Kombi (aka Type 2) prices have gone through the roof in recent years, with multi-window Sambas gaining serious investor interest. The current world record for a Samba is US$302,500 (Au$398,000) for a 1965 21-window Samba, bid at a USA auction in early 2017. Several examples have reached over US$200,000 in recent times. It wasn't always that way. The Kombi has always had significant cultural traction, but in any reasoned world they're a somewhat underpowered if very useful van. Utilising the rear-mounted air-cooled boxer four configuration already developed for the sedans, it was relatively cheap and quick to develop and to get to market in a post-war environment where making-do was a way of life. Production began in late 1949. A 1958 production date places this example as a Type 2 T1 series - in other words the first (and valuable) generation. Original specs for that year included a 1200cc engine and four-speed manual transmission. The seller makes it clear the car needs some major rust repairs, though the interior appears to be in surprisingly good shape. It's also said to be a runner, priced at $67,000.